Have you just completed a marathon session of scrubbing your tiles only to find that look just as dingy and old the next day? You may not be aware that different types of tile respond differently to different cleaning methods. Depending on whether your tiles are porous or not as well as the material they are made out of will dictate the type of cleaning methods that will work best for your particular type of tiled floors. Natural stone, ceramic, porcelain and terra-cotta tiles all react differently to water and household cleaning methods and solutions. Knowing which methods to use in cleaning your floors thoroughly is half the battle in keeping your tiles looking like new. Cleaning the grout in between the tiles is something else to consider. Grout is generally a completely different substance from the tile it surrounds. It takes a different approach and different solutions to clean it effectively and remove all the stains that can permeate grout surfaces. The most non-porous tiles available are glazed ceramic tiles. Ceramic tiles are impervious to water and basically stain-proof. In kitchens and areas where you’d expect to have spills from time to time, these are the best choice in kitchen tile flooring. Porcelain tiles are harder than stone or terra-cotta, but they still are considered to be porous. You should be careful about cleaning them thoroughly once you have spilled a material on them that could produce a stain. Stone and marble floors are porous, although they may not look like it. You should be careful when handling any staining liquids around these types of tiles. They are hard to the touch, but they still absorb liquid and can become discoloured. Terra-cotta tiles are the most porous of all. Although they may be glazed on the surface, the glazing generally isn’t continued on the side and back of the tiles. 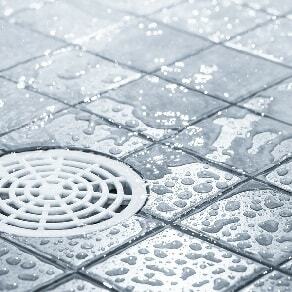 This makes them absorbent to any standing water that can seep through the grout, enter the tiles and discolour them. Generally porous tiles are cleaned only with plenty of clean water and a soft scrub brush. Detergents can penetrate the tiles and discolour them. Non-porous tiles can be cleaned with a mild detergent, a soft scrub brush and water. Sealants are available that will give your porous tiled floors an added level of protection from dirt, water and spills. Sealants should only be applied after the tiles have been thoroughly cleaned and dried to avoid trapping any residual water in them. Cleaning grout effectively is more difficult, especially if the grout is stained. Special solutions may be needed to rid the grout of all the stains and return it to a uniform colour. To return your tile floors to looking like new, call the professionals at Fresh Air carpet cleaning. We serve the entire Perth area.